It's no secret that shifting your own gears improves your quality of life. Because science or something. A young engineer at Ford has come up with a very clever hack of an Xbox controller and Ford's open source software to make a shift knob that helps you learn how to drive stick. It’s also a peek into the future of car mods. What the engineer, Zac Nelson, has done is to essentially create a smart shift knob. What does it do, exactly? It tells you when to shift gears by vibrating. But there's so much more to it than that! So much more! The knob, which is a custom, 3D-printed piece, talks to the car’s computer via OpenXC, the open-source application programming interface (API) Ford developed and proposed as an open standard for car communication. The knob uses an Arduino microcontroller to handle the data from the car (engine RPM, throttle position) and control the vibration motor from the XBox controller, and a 7-segment LED to visually show the gear position. There's also a full-RGB-color LED in there just for giggles, it seems. An Android tablet is used to configure the shift knob for both the particular car’s characteristics, or the goals of the shifting, say speed or economy. The tablet is plugged into the knob via a miniUSB port, and parameters of when the vibration happens can be set, so you can have it hold to redline for maximum acceleration, or set a much lower number for better fuel economy. The knob has been in cars ranging from a Focus to a Shelby GT500. 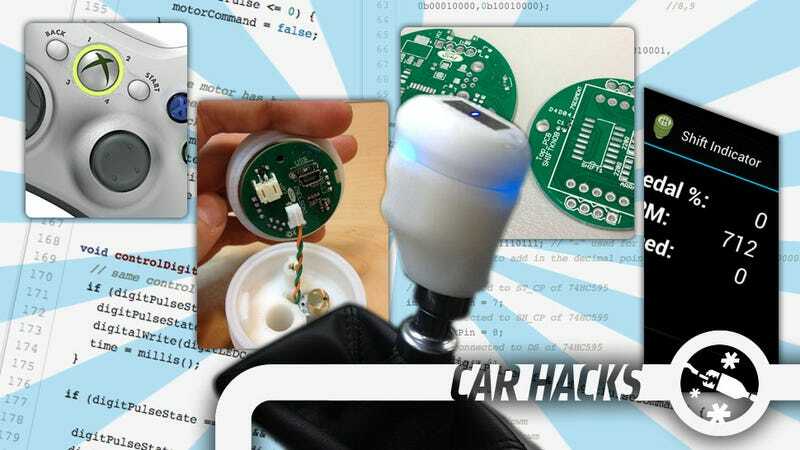 While this is a very clever little car hack just on its own, it’s an even better basic tutorial of what is becoming possible for car hackers and modifiers with a few fundamental tools. One of the most interesting things about the hack is the OpenXC standard. It’s still relatively new and not yet close to becoming an open standard across manufacturers, but it’s a good start. FuelLevel - current level of fuel in the gas tank. HeadlampStatus - are headlamps are off or on. ParkingBrakeStatus - is the parking brake is engaged or not. TorqueAtTransmission - the actual current torque in the transmission. TransmissionGearPosition - the actual current gear of the transmission. VehicleButtonEvent A ButtonEvent represents a button press, release or hold on the vehicle HMI. VehicleDoorStatus - is a door ajar? VehicleSpeed - the current forward speed of the vehicle. That’s all extremely handy data for a driver, and is plenty to make, say, an entirely custom instrument cluster, if you wanted. Want to replace your warning lights with a row of tiny mechanical semaphore flags? You could do it with the data given here. Want to make your car honk when a certain latitude and longitude are reached? It’s doable. This shift knob project also is a great example of how useful common programmable microcontrollers like the Arduino are for car hacking. Just downloading and reading the code (linked here) is a huge help for learning how to read data from the car, and then act upon it. An Arduino has a number of pins that can be connected to various other inputs or outputs. You can use it to read the data from the car, evaluate it, and based on parameters you’ve programmed in, act upon it in many ways. Here, the Arduino is reading RPMs, and based on the number set by the UI on the tablet, triggers the XBox vibration motor accordingly. That’s at its most basic, and setting the LED numerical display is gravy. This project could be simplified a bit by eliminating the display and fancy custom 3D printed shift knob, and hard-coding in the shift points to the Arduino (you could always connect the Arduino to your laptop to change them) if you knew how to drive stick, but wanted a way to make sure you always hit the right RPM shift points when you track your car or something. You could modify an existing shift knob for the housing, and while it wouldn’t look as cool as the 3D printed one, it’d work. This little project is a great tutorial for anyone looking to get started in modern car hacking. This is how hot-rodding in the future will be happening, and it’s worth getting familiar with the tools if you’re not already. Hopefully, these open standards to get data into and out of your car will soon become industry-wide open standards. There’s lots of potential fun to be had.